Whether it's a birthday party for a new, young Jedi, or a celebration for a classic Jedi Master, this collection will awaken the force in all party guests! With Master Yoda watching over the dessert table, Stormtroopers, Darth Vader, and Kylo Ren guarding the candy station, and one-of-a-kind dining table centerpieces that reenact scenes from The Force Awakens, you will feel like you just might be in a galaxy, far, far away! Everything in this collection from custom Star Wars linens, Star Wars signage, lightsabers, framed images from the Star Wars movies, and all other decorative items is handpicked or handmade for you to rent... so amazing party, you will have. 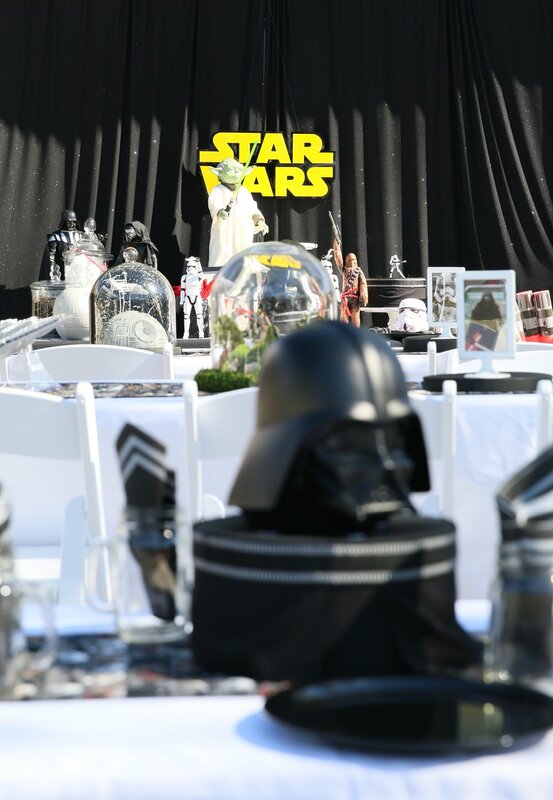 The Star Wars dessert table includes black linens with a custom Star Wars table runner, a Star Wars sign, Yoda, Kylo Ren, Darth Vader, Chewbacca, Stormtroopers, Star Wars lunch boxes, and black and white cake platters. One 10" x 22" Yellow Star Wars sign. An 18" Yoda with lightsaber watching over the party! Two 12" Stormtroopers for the dessert table attached to a stand/candy container. 12" Darth Vader secured to a stand/candy container. A 14" Chewbacca making sure no kiddo takes too many cupcakes! You don't want to steel from this cookie jar! 20" Darth Vader & 18" Kylo Ren to guard the candy station! This scene from Star Wars: The Force Awakens recreated inside a glass terrarium. (To be displayed only with glass cover.) There are regular centerpieces, and then there are THESE! Darth Vader's helmet placed on top of a caped platform makes for a winning centerpiece! Framed Star Wars images, including scenes from The Force Awakens. Custom Star Wars table runners for the dining tables. An Imperial Star Destroyer that can be used as table decor.